I've seen a couple posts about Foodie Pen Pals, hosted by Lindsay from The Lean Green Bean, on a fitness site I enjoy visiting. 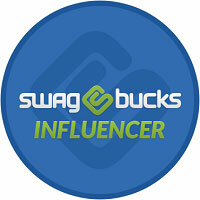 I was intrigued, and after reading a few posts from other participants, I decided to sign up! April was my first month participating, and I loved it. I received an awesome foodie package from Lisa and was able to try a variety of new-to-me foods. Lisa decided to go with a breakfast theme for my goodie box. She included a few different Kind bars--perfect for breakfasts on the go. I had the Fruit and Nut Delight bar the other day and it was delicious. Plus, it's all natural so it's something I can really feel good about eating! Lisa also sent some rolled hot cereal to be made with some coconut milk and sweetened up with agave nectar. I love having a bowl of oats for breakfast, and I often sweeten them up with agave, so this was perfect for me. I'd never had coconut milk before, but I'm now a fan! I haven't tried it yet, but I bet it would be delicious in smoothies too! I thought this was such a creative idea--nut and rice crackers with all-natural peanut butter and organic strawberry spread for mini PB&J sandwiches! The crackers have such a unique taste that I really enjoyed. I'm definitely going to be looking for them in a store around here. I found the peanut butter to be great, especially on the go. Finally, Lisa included one of her favorite treats--Sticky Fingers Fudge Brownies. My, oh my! These were delicious! Thank you, Lisa, for a fun and delicious goodie package! 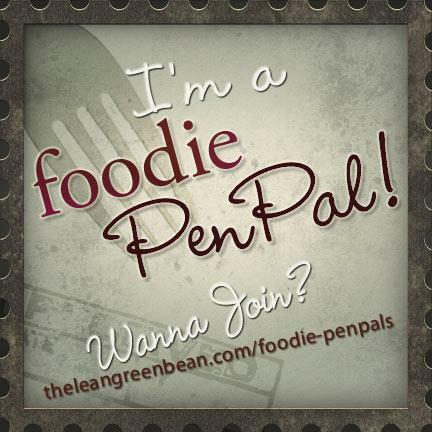 -Foodie Penpals is open to blog readers as well as bloggers. If you’re a reader and you get paired with a blogger, you are to write a short guest post for your penpal to post on their blog about what you received. If two readers are paired together, neither needs to worry about writing a post for that month. -Foodie Penpals is open to US & Canadian residents. Please note, Canadian Residents will be paired with other Canadians only. We've determined things might get too slow and backed up if we're trying to send foods through customs across the border from US to Canada and vice versa. -Visit The Lean Green Bean for more details! Posted by Melissa at 4/30/2012 08:18:00 AM 3 Yumm's!!! One of my favorite snacks is popcorn, so when I saw this churro popcorn, it called my name! And then it said, "make me...now". Luckily for me, I actually had cinnamon chips in the house, so I was able to quickly whip up a batch. While the popcorn is obviously a different texture than an authentic churro, the flavor is definitely there. This was great snack, and was perfect for our movie night! 1. In a small bowl, combine powdered sugar, sugar, and cinnamon. 2. In a large bowl, drizzle the melted cinnamon chips over the popcorn. Toss to coat. 3. Immediately sprinkle sugar mixture over popcorn. Toss again to coat. Let the popcorn cool completely before serving. Store in an airtight container. Posted by Melissa at 4/27/2012 07:59:00 AM 10 Yumm's!!! I like to take "old" recipes and tweak them to make something new. Sometimes, my little experiments flop, but other times, they are a complete success! Luckily for me, Mike is willing to try new things, and he often comes up with some odd concoctions of his own. For instance, he now puts taco sauce and olives in his omelets. He's got some strange taste buds I tell you! This recipe is actually a donut recipe. I loved the taste so much and I thought it would be delicious with some apples. I thought it would work just fine as a bread, and it did! 1. In a large bowl combine flour, sugar, baking powder, salt, nutmeg, and cinnamon. 2. In a smaller bowl, whisk together buttermilk, eggs, and melted margarine. 3. Pour wet ingredients into dry ingredients and stir until just combined. 4. Gently stir in diced apples. 5. Pour batter into a greased bread pan. Sprinkle brown sugar on top of the batter. 6. Bake at 350 for 50-60 minutes, until a toothpick inserted into the middle of the bread comes out clean. Posted by Melissa at 4/25/2012 08:33:00 AM 2 Yumm's!!! 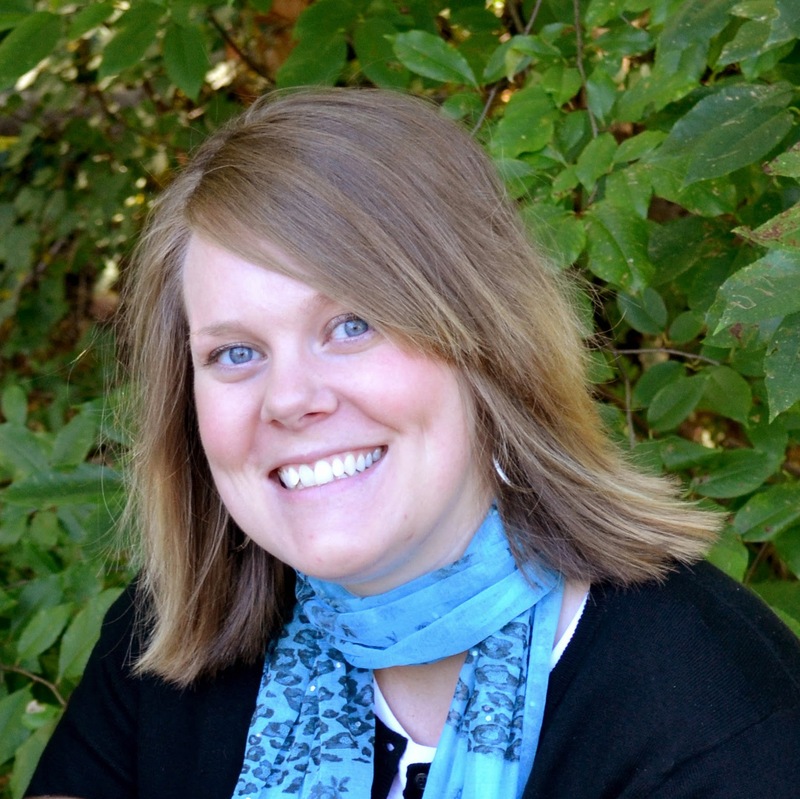 For the Secret Recipe Club this month, I was assigned to Jamie's blog, Thrifty Veggie Mama. I really enjoyed looking through Jamie's blog. Her family is vegetarian, and she cooks healthy and delicious meals for her young family. I'm looking forward to making more of her healthy recipes! As I browsed through her blog, making a list of recipes, the whole wheat tortillas caught my eye. Since they've been on my list to make for a while, and since I'm trying to limit the amount of white flour I'm eating, this recipe was perfect! I'm not sure why I haven't made them before, probably because it's so easy to just buy a package at the store. I knew that they were pretty simple to make, but this month's Secret Recipe Club gave me the motivation I really needed. I will definitely be making these tortillas again, particularly because I need practice in rolling them out! Let's just say I ended up with some very oddly shaped tortillas! The whole wheat flour gave the tortillas a different flavor than a typical white flour tortilla, but I really enjoyed it. My tortillas stiffened up after they cooled, so before using them, I would microwave them for a few seconds. 1. Place the flour, salt, and oil in the bowl of your stand mixer and slowly mix. 3. Cover the bowl and let it sit for 20 minutes. 4. Place the dough on a floured surface and knead it a few times. 5. Divide dough into 10-12 equal sized balls. 6. Cover dough balls and let them sit for 20 minutes. 7. Place each ball on a lightly floured surface and roll out to a circle about 8 inches in diameter. 8. Place tortillas on a warmed griddle (mine was 350 degrees) and cook for 1-2 minutes per side. 9. Place cooked tortillas on a plate and cover with a towel to keep them warm and soft. If you are not serving your tortillas right away they can be stored in an airtight container (or Ziploc bag) in the refrigerator. Posted by Melissa at 4/23/2012 12:00:00 PM 22 Yumm's!!! I love to eat fruit. In fact, growing up I would choose a piece of fruit over ice-cream for dessert! Even now I probably would too! I enjoy every kind of fruit, and in various forms. I like to dehydrate some fruits and eat them that way, or make it into fruit leather. Of course, I enjoy fresh fruit as well. A few weeks ago, I was contacted by Lancaster International Trading Company and asked if I would be interested in sampling their Enduring Sun dried apricots. I jumped on the opportunity to try something new. I eagerly anticipated the day that my package would arrive, and I was not disappointed. I received 4 types of dried apricots, along with a bag of sun-dried tomatoes (look for a recipe soon!). Each of the apricot types has a slightly different flavor. I sampled the Jelena (extra large sweet & tart with a hint of clementine), the Larissa (small & sweet with a hint of orange), the Natasha (unique flavor with a delightful lemony afterglow), and the Valentina (extra large sweet & slightly tart with a hint of clementine). The apricots were delicious on their own, but I wanted to create a recipe to show off the flavors of the apricot. I spent a few days thinking about what I could use the apricots for. I actually came up with quite a few ideas, some of which may appear here pretty soon. I was in the mood for a healthy cookie, and so I created these. I think they are delicious, and I have been enjoying them warmed up in the microwave. The texture is similar to baked oatmeal, and I think the chocolate chips really complement the Jelena apricots. 1. Mix ingredients together in a large bowl until well combined. 2. Drop cookies by the spoonful onto a greased cookie sheet. 3. Bake at 350 for 10-12 minutes, until the cookie is set. Disclosure: I received the apricots courtesy of Lancaster International Trading Company. I was not compensated for this post. Any thoughts and opinions in this post are my own. Posted by Melissa at 4/20/2012 08:14:00 AM 3 Yumm's!!! What do you typically eat for breakfast? My usual breakfast is either a bowl of steel cut oats, or an egg on an English muffin. However, if time and calories weren't an issue, I would gladly have pancakes, waffles, and french toast every day! Since I don't have time for that, I like to make a big batch of pancakes for supper and then freeze them so I can just thaw what I want for breakfasts. I was thrilled to find a healthy pancake recipe. I was a little hesitant at first when I read the ingredient list because I'm not a fan of cottage cheese. I figured I had nothing to lose, so I'd give these a try. I was so glad that I did! I added in a few chocolate chips for some sweetness, and then I ate the pancakes plain. No syrup for me! I've never liked syrup...another of my weird traits! I made these on a Friday, after my long run, and they kept me full and energized all morning. 1. Blend all ingredients together in a food processor. Let it sit for 5 minutes. 2. Pour onto batter onto hot griddle and cook for about 2 minutes on each side. This recipe can also be made into waffles using your waffle iron. Store any leftovers in the fridge. Posted by Melissa at 4/18/2012 07:52:00 AM 5 Yumm's!!! One of my favorite healthy replacements is spaghetti squash. I enjoy eating it a variety of ways, but one of my favorite ways, as the name suggests, is eating it as spaghetti. I'll typically make regular spaghetti noodles for Mike, and a spaghetti squash for myself. When compared nutritionally to pasta, spaghetti squash is the clear choice. 1 cup of spaghetti squash has just 42 calories and a variety of vitamins and minerals. (Source) In comparison, spaghetti noodles contain 174 calories in a cup. (Source) Spaghetti squash is the clear choice if you are counting calories. Even if you're not, I challenge you to give spaghetti squash a chance. I think you'll enjoy it! 1. Using a sharp knife, cut the spaghetti squash in half lengthwise. Scoop out seeds and discard. 2. Place both halves of the squash on a cookie sheet. Put 1/2 Tablespoon of butter in the center of each piece of squash. 3. Bake at 350 for 35-40 minutes, until squash is softened. 4. Using a fork, scrape the inside of the squash to form spaghetti-like strands. 5. Pour 1/2 cup of spaghetti sauce onto each half of the squash. 6. Top with meatballs and mozzarella. 7. Return to the oven for 3-5 more minutes, until the cheese is melted. Serve hot in the squash shells. Posted by Melissa at 4/16/2012 08:38:00 AM 6 Yumm's!!! This cake is made with only 4 items, and the result is the most moist cake I have ever had. It doesn't have eggs or oil in it, so the cake doesn't rise like a typical cake. I thought it was delicious, and I'm sure you will too! I have not experimented with any other cake mixes or pudding flavors, but I can think of so many combinations that would be delicious. If you try anything new, let me know so I can try it too! Doesn't that bite look delicious? 1. Mix the pudding mix and milk together in a medium bowl. Let it stand for a few minutes until it thickens. 2. Add the cake mix and stir until combined. The batter will be very thick. 3. Spread the batter in a greased 9x13" cake pan. 4. Bake for 30 minutes, or until a toothpick stuck in the cake comes out clean. 5. Remove the cake from the oven and top with halved marshmallows. Put the cake back in the oven for about 2 minutes, until the marshmallows are toasted. Posted by Melissa at 4/13/2012 08:37:00 AM 8 Yumm's!!! I was inspired to make this recipe after I saw one of my co-workers eating it. We often talk about what we're eating for lunch, and he was showing me what his wife had made that day. It looked delicious, so I asked him if he'd ask his wife for the recipe. He thought she found it on Pinterest, and since I follow her boards, I figured I'd see if I could find it. I was successful, and I'm glad I was! I made this recipe that night and took it for lunch the next day. It is so easy to put together, and delicious. I changed up the recipe a bit to suit my tastes, and I've added in diced tomatoes a few times that I've made it. This is a perfect lunch for at work. Combine chicken, corn, beans, mayonaise, vinegar, and sugar in a bowl. Posted by Melissa at 4/11/2012 09:41:00 AM 5 Yumm's!!! A few weeks ago, we had some unseasonably warm weather here in Michigan. When temperatures are typically around 40 degrees, we experienced a week of near (or above) 80 degree days! It was incredible, and gave us a chance to do some grilling. Much to our dismay, though not a surprise at all, the weather has returned to normal and in fact it seems much cooler because we had such hot days. I try not to make a lot of soup during the warm summer months, I prefer to grill meat and vegetables and eat a lot of fresh food. But now that we're back to our typical cooler temperatures, I decided to take advantage of it and make some hot soup. It's especially delicious on gray rainy days! 1. In a large pot, warm olive oil over medium heat. 2. Crumble sausage and add to the pot. Cook until browned, about 5 minutes. 3. Transfer sausage to a paper-towel lined plate to drain. 4. Discard all but 1 Tablespoon of fat from the pot. Add onion and garlic and cook until soft, about 3 minutes. 5. Return sausage to the pot and add chicken broth, water, and beans. 6. Bring soup to a boil and then reduce heat to simmer for 15 minutes. 7. Stir in kale until wilted, about 2 to 3 minutes. Season as needed with salt and pepper before serving. Posted by Melissa at 4/09/2012 08:09:00 AM 4 Yumm's!!! There are very few foods that Mike and I don't agree upon. One minor one is fish--I don't care for it, but he doesn't mind it. The biggest issue is fruit. I could eat fruit every meal for the rest of my life and be perfectly happy. Mike eats his banana every day and would be pleased to continue that way for the rest of his life, with the possible exception of strawberries. I was thrilled to get to go blueberry picking last year. Even though Mike doesn't eat them, he still encouraged me to go picking (by myself, of course!) and freeze an incredible amount of blueberries! I use them year-round for smoothies, in pancakes, and in muffins. When Tina announced that this month's Crazy Cooking Challenge was to find the recipe for the ultimate blueberry muffin, I jumped on this opportunity to scour the web for the best recipe. And friends, I do believe I have found it! My search led me to Christy's site, The Girl Who Ate Everything. If the story she told in her blog post didn't draw me in, the pictures of her muffins certainly did! Her story had me giggling, and her pictures had me drooling. I knew I found an amazing recipe. I borrowed a giant muffin tin from Mike's mom so I could make specialty-shop sized muffins. Let me tell you--they did not disappoint! 1. Prepare streusel topping by combining the sugar, flour, butter, and cinnamon in a small bowl with a fork (or your hands). Mix until the texture resembles wet sand. 2. Whisk flour, baking powder, and salt together in a small bowl. Set aside. 3. In a large bowl, cream the sugar and butter together until fluffy. 4. Add in the eggs, vanilla, and milk and stir until combined. 5. Add the flour mixture and stir until just combined. 7. Scoop into greased (or paper lined) muffin tins. Sprinkle muffins with streusel topping. 8. Bake at 350 for 20-25 minutes, until a toothpick inserted in the middle of a muffin comes out clean. Posted by Melissa at 4/07/2012 12:00:00 PM 24 Yumm's!!! I'm excited to announce that I have finally created a Facebook page for Melissa's Cuisine! You can find it here. I hope to get some good food related discussions going on that page, and I'd love for you to join in. I must have pickles on the mind lately. Last week, I shared a recipe for pickle dip, and today I have another fabulous pickle recipe for you! You may remember my recipe for fried pickles that I shared last year. I created that recipe because I had heard that our favorite place to get them was closing, thankfully they didn't end up closing, so we were still able to have our fried pickles at the beach last summer. These are similar, but much healthier because they are not fried! Mike and I gobbled these up the day I made them, and I know we'll be making them again soon. 1. Beat egg in a shallow bowl. 2. Add in the flour and mix until it's the consistency of paste. 3. Stir in the worcestershire sauce, seasoning salt, and dill until well combined. 4. Add your pickles to the paste mixture and toss until coated. 5. Pour the breadcrumbs into a shallow dish. Coat each pickle, one at a time, in the breadcrumbs. 6. Place on a wire rack on top of a cookie sheet. 7. Bake on broil (500 degrees) for 4-6 minutes, until golden. 8. Remove from oven and flip each pickle over. Return to oven and bake 3-4 more minutes. Serve warm, with ranch dressing. Posted by Melissa at 4/04/2012 08:17:00 AM 8 Yumm's!!! When I saw this recipe in a magazine, I knew I had to add it to our menu. The marinade gives the steak a delicous taste and makes the meat nice and tender. I would have prefered my steak to be slightly more well-done, but since this was my first time making a steak that is supposed to be served pink, I think it turned out well! 1. Whisk canola oil, vinegar, mustard, ketchup, garlic, and Italian seasoning in a medium bowl. 2. Combine with steak in a large Ziploc bag and refrigerate for at least 4 hours, or overnight. 3. Remove steak from marinade and season with salt and pepper. 4. Broil or grill steak for 3 minutes on each side, or until the steak reaches an internal temperature of 125 degrees. 5. Let the steak stand for 5 minutes, then slice thinly against the grain. Posted by Melissa at 4/02/2012 08:15:00 AM 6 Yumm's!! !